1,4-Dioxane is a colorless, highly flammable hygroscopic liquid with a mild, sweet ether-like odor. It is infinitely soluble in water and most organic solvents (i.e., alcohol, ether, acetone, benzene, acetic acid). It is also miscible with aromatic hydrocarbons and oils. 1,4-Dioxane is stable, incompatible with oxidizing agents, oxygen, halogens, reducing agents, moisture. 1,4-Dioxane is used primarily as a solvent in paints, varnishes, lacquers, cosmetics, deodorants, cleaning and detergent preparations, and in liquid scintillation counting mediums. There is also the potential for use it as a solvent in the processing of crude petroleum, petroleum refining, petrochemicals, pulp and paper, explosives, commercial printing, electroplating/polishing, pesticides, dyes, fibers, pharmaceuticals, veterinary drugs, adhesives, semiconductors, electronic components, photographic equipment, magnetic recording media, polymers, plastics, rubber manufacture, organic and inorganic chemical manufacture. In the laboratory, 1,4-dioxane is useful as a cryoscopic solvent for molecular mass determinations and as a stable reaction medium solvent in chemical synthesis, research and analysis. Because of its lower toxicity, it is sometimes substituted with tetrahydrofuran (THF) in some processes. 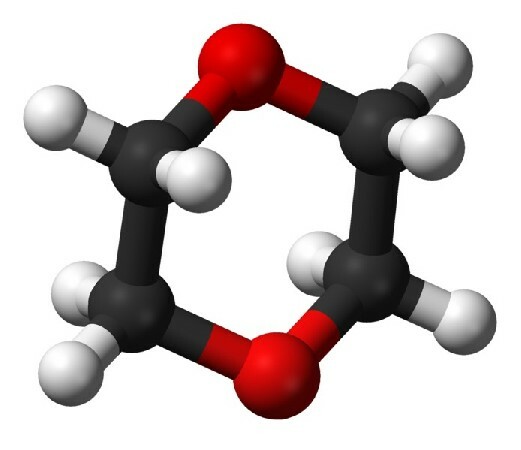 1,4-Dioxane often has been used with chlorinated solvents or volatile organic compounds (VOCs). It is primarily used as a stabilizer and corrosion inhibitor for 1,1,1-trichloroethane for storage and transport in aluminium containers. 1,4-Dioxane is also used as a wetting and dispersing agent in textile processing. Preparation of histological sections for microscopic examination. Analytical reagent for the laboratory use. Dioxane is classified by the EPA as a Group 2B carcinogen.